The UN Security Council in a press statement Friday denounced North Korea's recent missile tests in a unanimous decision. The UNSC said the North's missile tests, including its latest submarine-launched ballistic missile test last week, were "serious violations" of international regulations. It cited North Korea's ballistic missile tests from April to June as direct snubs of international condemnation and threatened to take stronger measures. The press statement is the weakest of the instruments available to the UNSC but requires the endorsement of all five permanent members, which include North Korean ally China. 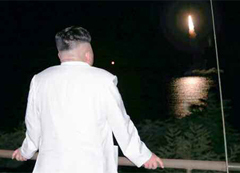 North Korean leader Kim Jong-un watches a ballistic missile launched from a submarine last Wednesday in this photo from the Rodong Sinmun daily. North Korea rejected the statement. "Now that the U.S. posed threats to the dignity and the right to existence of [North Korea] defying its serious warning, [the North] will continue to take a series of eventful action steps as a full-fledged military power," the North Korean Foreign Ministry said in a statement. The UNSC consistently condemned North Korea's ballistic missile tests until June, but in July China and Russia became reluctant to back any further condemnations. Earlier this month, China insisted on stating its opposition to the U.S. deploying a Terminal High-Altitude Area Defense battery in South Korea in any statement condemning the missile tests, which scuppered a fresh statement. There were concerns that China would make similar demands this time, but it did not. Japanese media speculated that China went along in order to ensure the success of the G20 Summit in Hangzhou in early September.